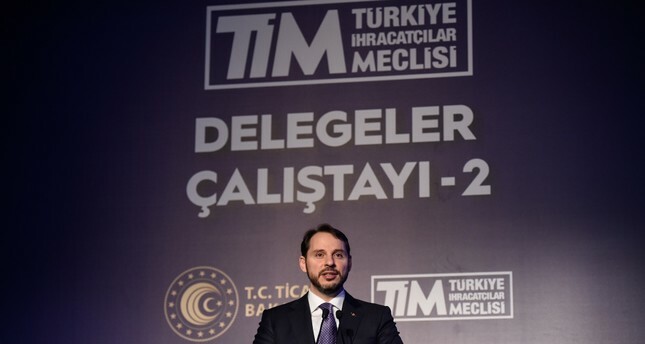 Treasury and Finance Minister Berat Albayrak speaks at the Delegation Workshop of Turkish Exporters' Assembly (TİM) in Istanbul, Feb. 7, 2019. As the global and regional economies get increasingly exposed to protectionist tendencies, quickly changing monetary policies, and fears of a recession, now, almost everyone think that 2019 will not be an easy and stable year for global markets. The fears are more evident in the downward trend of growth indicators in Europe and the world's second largest economy, China. Turkey, however, is aspiring to turn these risks into opportunity by instituting the necessary conditions required, Treasury and Finance Minister Berat Albayrak has said. "In an environment of increasing uncertainties and protectionism as well as in a period when the economic growth in China and Europe has started to slow down, we need to work more than ever and avail this period," Treasury and Finance Minister Albayrak said during his address at the Delegation Workshop of Turkish Exporters' Assembly (TİM) Thursday in Istanbul. Minister Albayrak stressed that Turkey's exports hit $170 billion over the last 16 years, which were recorded around $30 billion in 2002. Underscoring the necessity of a new success story for the Turkish economy, all public actors, exports and all stakeholders will write this story in cooperation, the minister said. Albayrak drew attention to the market turmoil in August and September 2018, when the Turkish lira lost almost half of its value. "The year 2018 was a year of acquiring immense experience and fortifying our immune system against threats," he said and continued, "The measures we have taken so far have enabled us to start preliminary work on a stronger financial structures and ramped up our immunity against political and financial shocks." "Now it is time to accomplish all structural and systemic transformations we have been delaying due to political, social and economic attacks. We are planning to execute changes in organizational structures in a coordinated and efficient way," the minister noted. The minister also elaborated on dropping interest rates. "In the last quarter of 2018, the interest rates considerably fell," he said and stressed that liquidity will further ease in the next few months. Five-year government bond yields maintained a downward trend at 15.40 percent yesterday, while the two-year bond had an 18 percent yield, which fell by 63 basis points in January. The Treasury previously announced plans to borrow in Chinese yuan with panda bonds and samurai bonds denominated in Japanese yen. The minister also drew attention to Turkey's credit default swaps (CDS) that have recorded profound improvement in the last couple of months. According to yesterday's data, Turkey's CDS was down 4.05 percent at 292.4 points. Turkey 5 Years Sovereign CDS peaked at 566.38 on Sept. 4, 2018, and a saw the lowest yield of 152.28 on Jan. 5, 2018. Speaking of the fight against inflation, Albayrak highlighted the government is taking all and any measures to tame inflation and the efforts panned out with falling inflationary pressures. The country's annual inflation went up 0.05 percentage points from 20.3 percent in December 2018 to 20.35 percent in January of this year. The slight increase stemmed from rising food prices due to demand shocks emanating from seasonal conditions. Albayrak explained that if food prices remained unchanged from December 2018 to January 2019, inflation would have been recorded at -0.43 percent and annual inflation would have been around 18.85 percent. To tweak the disruption in food prices in the short term, municipalities will institute selling points for foodstuffs. To ensure stability in food prices and boost agricultural productivity, the government will announce an investment package to transform greenhouse infrastructure, Minister Albayrak said. State-lender Ziraat Bank is scheduled to announce today the new investment program at the end of this week or early next week, he added. The loans to be provided by Ziraat Bank will require low-interest rates and will be subsidized by the treasury. Albayrak also said organized zones will be established in areas rich in geothermal resources and the loans will be provided in greenhouses to be established in these zones. In order to fight inflation, the Treasury and Finance Ministry in October prepared a full-scale program, spearheaded by Albayrak. The program included a 10 percent cut in prices of certain retail products and consumer loans. In addition to this program, the government also introduced tax reductions in real estate, automotive, furniture and home appliance sectors. These efforts, coupled with tight monetary policy and supported by falling commodity prices, have tamed inflation to a certain extent in the short term.